Student activists at an anti-bussing protest in Charlotte in 1970. The story of white supremacy in the United States is littered with the names of famous, white men who wielded power over influential institutions. But scholar Elizabeth Gillespie McRae argues that focusing solely on the dramatic acts of figures like George Wallace or David Duke obscures an important part of the narrative of white supremacy: the role of white women. White women had an important but overlooked role in maintaining systems of oppression and segregation, argues author Elizabeth Gillespie McRae. 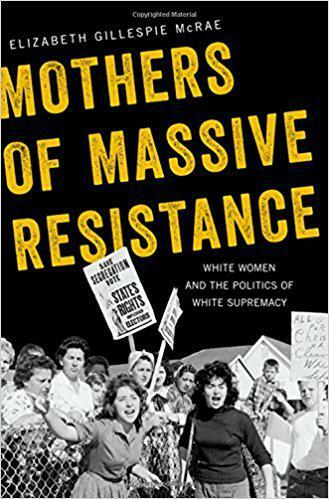 In her new book “Mothers of Massive Resistance: White Women and the Politics of White Supremacy,” McRae details how from the 1920s to the 1970s, white women have sustained white supremacist politics through their roles in schools, homes, hospitals, the press, and political discourse. White women were the forces behind designing educational curriculum and upholding social and political institutions that reinforced white supremacy in communities around the country. Host Frank Stasio talks with McRae about her research and the political dangers of thinking that all women vote and act alike. McRae, an associate professor of history at Western Carolina University, will talk about her work at the Chapel Hill Public Library Wednesday, Oct. 24 at 7 p.m. The event is organized by the Center for the Study of the American South at the University of North Carolina at Chapel Hill.